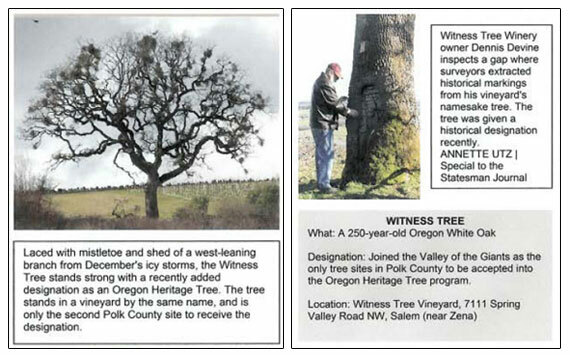 ZENA – The “Witness Tree”, namesake for the Witness Tree Vineyard, recently became the second arboreal site in Polk County to receive the Oregon Heritage Tree designation. The other Polk site with this destination is the Valley of the Giants, deep in the coast Range near the Lincoln County border. An Oregon While Oak tree is the bosom of a Spring Valley hillside northwest of Salem: the Witness Tree is about 250 years old. Its historical significance stems from service as a survey marker. Copies of original survey notes on display at the vineyard are dated July 8, 1854, and indicate the then 2-foot diameter tree was used as a landmark from which a boundary for donation land claim No. 51, the ‘Clairborne C. Walker’ claim, could be located. Witness Tree Vineyard proprietor Dennis Devine applied for the historical designation about a year ago through the Oregon Heritage Tree program. With help from Scott McArthur of Monmouth and the Polk County Historical society, his application was accepted and confirmed. He received a letter of acceptance in mid-February. A statewide dedication ceremony is scheduled for the first week in April 2010. Today, the tree’s diameter at its base is 4 feet 6 inches. Devine said the original survey marks incised into the tree ‘s trunk were later cut away, presumably by souvenir hunters. This has left a significant cavity in the trunk, yet the tree has survived.